Violet Hawthorne is beyond mortified when her brother Ezra turns their deceased parents' New England country inn into a brothel to accommodate the nearby lumberjacks; but when Violet's own reputation is compromised, the inn becomes the least of her worries. In an effort to salvage her good name, Violet is forced into an engagement with a taciturn acquaintance; Vance Everstone. As she prepares for a society wedding, Violet learns that her brother had staked her hand in marriage in a heated poker game with the unsavory Rowen Steele, and Ezra had lost. Now Rowen is determined to cash in on his IOU. With danger stalking her and a new fiance who hides both his emotion and his past, Violet must decide who to trust and who to leave behind. This has been an enjoyable series to read. This book is no exception. I enjoyed getting to know Violet and Vance. I can imagine the horror she felt when her brother wanted to turn their family home into a brothel. What was he thinking. I thought the author did a good job in helping us to feel the chemistry between Violet and Vance as they got to know each other. There were times I felt really bad for Violet, but she was such a strong women that she handle everything with grace. The author captures the time and place transporting you back in time. I also thought the characters were well developed. Even though this book is a part of a series you are able to read it as a stand alone but I know you will want to go back and read about the other Everstones. This is a book that will grab you on page one and not let go. You will be thinking about it even after you are finished. A great addition to this series. 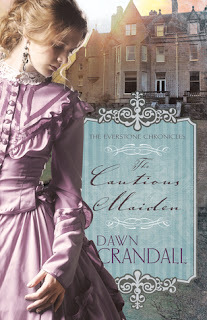 Dawn Crandall is an ACFW Carol Award-nominated author of the award winning series The Everstone Chronicles, which consists of four books: The Hesitant Heiress, The Bound Heart, The Captive Imposter and The Cautious Maiden which released October 4th, 2016. Apart from writing, Dawn is also a mom of two little ones and serves with her husband in a premarital mentorship program at their local church in Fort Wayne, Indiana. A graduate of Taylor University with a degree in Christian Education and a former bookseller at Barnes & Noble, Dawn Crandall didn't begin writing until 2010 when her husband found out about her long-buried dream. It didn't take her long to realize that writing books was what she was made to do. Dawn is a member of the American Christian Fiction Writers, the secretary for the Indiana ACFW Chapter (Hoosier Ink), and an associate member of the Great Lakes ACFW Chapter. She is represented by Joyce Hart of Hartline Literary Agency.